Now to pick the optics. Couple of initial thoughts, nice wood grain and kind of a gray color. Single set trigger that breaks like a glass rod, no creep. Gun arrived with sights and no rings. GAG listed the gun as a "Rustic" carbine, but that was discontinued a few years ago. I emailed GAG about the lack of rings, will see what happens. But I am keeping this rifle, going to the local indoor range later to pop a few primers at 25 yards. I have some PPU and some Brown Bear soft point ammo headed this way. CZ recommends European ammo due to chamber specs, best results with .311 projectiles. May try some Hornady steel case in the future, but today just Wolf steel case. Gonna top this little dude with a Trijicon Accupoint 3x9x40 green dot. Oh by the way, there was a little High Standard Sentinel Deluxe on consignment at the LGS, that climbed in the box with my carbine. Last edited by Gator; 03-04-2018 at 03:37 PM. 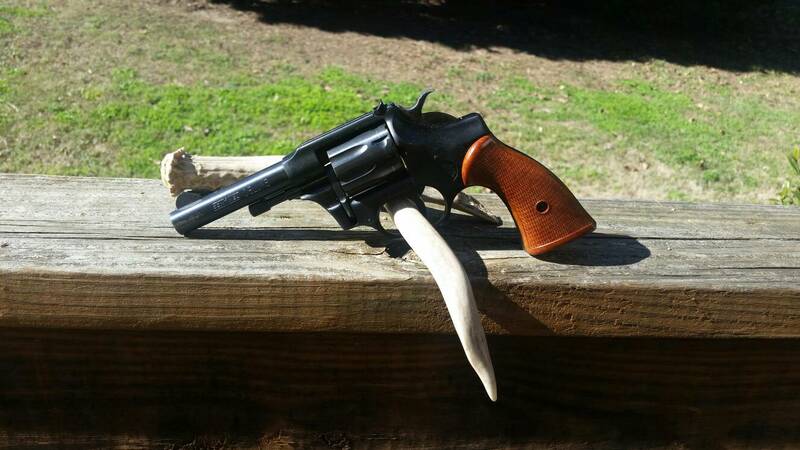 Good looking High Standard revolver,good find there. CZ makes great rifles,I'm just not into a bolt action 7.62 x 39 chamber. Nice rifle that shoots crap ammo! Everything I have read indicates it shoots crap ammo pretty darn well. Hornady makes some steel case with their SST bullet, I will get some of that for deer season. Any accurate and reliable gun is a keeper! Nice looking revolver, need a range report on it too. I had some Cabela's gift cards, so I ordered some Hornady Steel Case SST for in store pick up. Grab A Gun responded about the scope rings, they gave me a $20 credit, I asked them to bump it to $40, but they would not. I had already ordered some Burris rings off EBay for $43 delivered, so $23 net is not bad. Last 4 shots before my time was up at the range. 100 yards, PPU soft point 123 grain ammo. Not bad for cheap ammo. First time visiting that range, 100 yard indoor. Charge $50 per hour for non-members. They have a nice setup, set the distance on a key pad and the target runs out. The table was better suited for sand bags, but I carried my sled. Sled was cockeyed and not as stable as I would have liked. But, I can bust a pig or a coyote if I see one. There is nothing not to like about the 527. Just a very well made rifle. 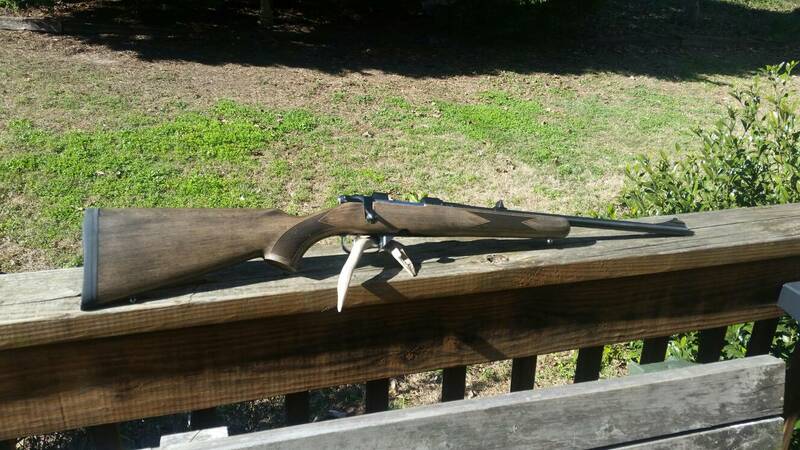 My .223/5.56 varminter is one of the finest rifles I've ever owned. Looking at the last target, it seems they did a fine job. Congratulations on your fine rifle. Looks like a good shooter, $50/hr is too steep for my cheap azz! If you reload for the 7.62x39 here is some good bullets for a good price. Got first blood with my carbine. 10 point at 20 steps. Wow! Very nice Gator! Are you putting that one on the wall? Congratulations on an awesome buck sir! That is a nice rack! Yep, wall hanger for sure. Dude at the processor sees a lot of bucks, says my buck will score in 140s. Great buck! He would hang on my wall for sure. Congrats on an early kill too. Our rifle season opens next Saturday. He's a brute. What state was he taken in?